Dorchester Brewing Company is Boston’s newest Tap Room filled with fresh craft beer located right on Mass Ave in Dorchester! We’re even more than just your typical tasting room in a brewery. On our 20 line tap system, you’ll find house DBco beers alongside local brewing partners and regional collaborators. 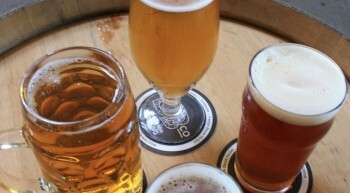 Sample a tasting flight or grab a full pour and take some fresh beer to go! 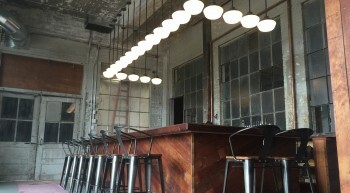 Our Boston Tap Room has plenty for all – games (Battleship, anyone? ), wi-fi, a beautiful outdoor patio, food trucks for special events, appetizers available anytime for purchase, takeout and delivery menus, fresh beer to go and of course plenty of DBco merch to wear out the door. And, we’ve also got a great private event space if you’re thinking about hosting an event like a birthday party, small group meeting or even a wedding, contact us today! We have plenty of FREE on-street parking nearby. Whether you’re a beer nerd, beer novice, have your kids or your computer in tow, we’ve got a great space for you to enjoy and hang out. We look forward to sharing our love of beer with you! Tours: Every Saturday at from 12pm-2pm. See details below. Click here to see what’s on tap and check out upcoming events. IDs: We check IDs for everyone. You must show a valid 21+ ID to be sold beer. Valid forms of ID include: US Driver’s License, Liquor ID Card or State Issued ID Card, Military ID, US Passport or Passport Card and International Passport and Foreign driver’s license with a photo of a corresponding passport. We invite those under 21, such as families, kids and babies to visit our taproom with parents or guardians and enjoy games, our non-alcoholic beverages (soda and seltzer) and food any day of the week. After 6pm on Fridays and Saturdays you must be 21+ to visit. Brewery Tours: Tours run every Saturday between 12pm-2pm and run approximately 20 minutes. Sign up list is available on-site in the Tap Room the day of each tour and limited to the first 10 people. $5 donation suggested to local charity (cash only). Food: Food trucks are on-site for special events (typically Friday evenings and Saturday and Sundays) when noted on our website and social media pages. You are also welcome to order in or bring your own food – carry in, carry out policy. We have a special Express Delivery Menu available from Pantry Pizza in Dorchester with exclusive discounts for our brewery customers. Fresh Beer to Go: We sell Crowlers (32 ounce cans) to go as well as a limited supply of 4-Packs of select DBco beers. Unfortunately, by law we cannot fill growlers. Additionally, due to tax law, you can not consume Crowlers on premise. No external alcoholic beverages may be brought in and consumed on site. Private Events: We are excited to host your next private event whether it be a small group meeting, fundraiser, birthday party or wedding! To learn more about hosting your private event with us, please send us a note through our contact us page. Getting here: We are located at 1250 Mass Ave. in Dorchester. There is typically plenty of on-street parking (no meters). If you are planning to take public transportation, we are located on the red line between Andrew and JFK/UMass stops and also close to several bus stops. Please visit //www.mbta.com/ to find your best route. We have plenty of FREE on-street parking, so there is typically plenty of room for everyone nearby! 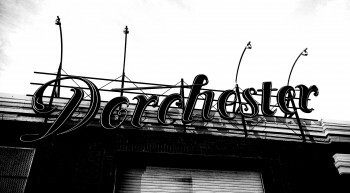 Dorchester: Never been to the DOT? Not OFD? (That’s lingo for Originally From Dorchester). Technically Dorchester is part of Boston proper and located super-close to downtown, so you have no excuses. This could be be the very reason you explore the city a little bit more and we’re certain you’ll be glad you did. Come hang out in our Boston taproom and outdoor patio. We have a 20 line tap system with plenty of varieties to choose from so you can sample and taste new craft beers and chat with our Head Brewer about his recipes. As you might expect, we have a ton of ongoing activities in our Boston brewery that are all things beer-related. From fresh beer launches, festivals and plenty of fun events for everyone, we’ve got you covered. Contact us for private beer events like weddings, birthday parties and more!